Naomi Do, third-year PharmD student, working in the lab of Assistant Professor Michael Taylor, with research associate Kevin Lanham. Learning to think critically, raise questions, and solve problems, as well as to understand primary literature, collaborate with fellow researchers, and communicate your research findings are lifelong skills that serve PharmD graduates well in their careers and in their personal lives. “The idea of working on a problem and solving it is good for everybody, but as the job market in pharmacy is changing—and it will change over the next five to 10 years—showing you have experience solving problems is beneficial,” says Mel de Villiers, associate dean for Academic Affairs and professor in the Pharmaceutical Sciences Division at the University of Wisconsin–Madison School of Pharmacy. As part of a top-tier research university, the School of Pharmacy offers PharmD students substantive research exposure across various research areas. The research opportunities include lab-based pharmaceutical sciences and basic science research in drug discovery and development; clinical and translational research that applies new discoveries in clinical and community settings; and research that advances the practice of pharmacy and improves education to make meaningful health care interventions to enhance patient care. Engaging in research prepares PharmD students for a diverse range of rich career paths, which can include pharmacy roles in the pharmaceutical industry, managed care, health providers, government agencies, and academia as well as in community pharmacy, hospital pharmacy, and many other areas. “Long term, if PharmD students want to explore other opportunities in pharmacy through residencies, fellowships, or work in less traditional settings, like the pharmaceutical industry, then being exposed to the most cutting-edge research at a tier-one research university—either at a basic level or at a translational level—is an advantage for students,” says de Villiers. The growing interest in research among PharmD students is significant. The number of students enrolling in independent study research has increased 75 percent in the last three years, from 40 students in 2014 to 70 students in 2017. Naomi Do, third-year PharmD student (DPH-3), one of the recipients of the Ronald T. and Pamela K. Borchardt scholarship for basic research in the pharmaceutical sciences, worked on blood-brain barrier (BBB) research with Michael Taylor, assistant professor in the Pharmaceutical Sciences Division. She says she’s building important skills that will make her more successful. Third-year PharmD student Naomi Do conducted blood-brain-barrier research with Pharmaceutical Sciences Division Assistant Professor Michael Taylor. Judy Lee (DPH-3) recognizes the value of her research experience with Glen Kwon, professor in the Pharmaceutical Sciences Division, and in the Kwon Lab, studying the nanoformulation of a combination of anti-cancer drugs, including paclitaxel. “The critical thinking and multitasking skills I have developed from conducting research is very useful in my PharmD career,” says Lee, another Borchardt scholarship recipient. “I have become a more detail-oriented person from doing research because every valid experiment has to be tightly controlled. Arash Bashirullah, associate professor in the Pharmaceutical Sciences Division, has worked with many students in his lab, most of whom have stayed for two years or longer. “The students have all done really well because they have learned how to solve biological problems,” says Bashirullah, who has seen firsthand how research prepares pharmacy students for their careers. Working on pharmaceutical sciences research, while introducing students to a possible career path, also helps PharmD students understand the connection between drug development and delivery and their role as pharmacists. As the field is becoming increasingly complex, it’s important for today’s pharmacists to have that scientific context. But pharmaceutical sciences is just one piece of the research pie. Cecilia Volk (DPH-2), for example, is conducting research that translates basic science insights to help treat patients in a clinical setting. Volk says that she immediately sought out research experience when she arrived at the School of Pharmacy. Since faculty encourage students to pursue their research interests regardless of level or experience, she was able to start working in the lab of Associate Professor Warren Rose of the Pharmacy Practice Division, in her second semester of pharmacy school. In the Rose Lab, Volk conducts a variety of bench-top experiments and patient chart reviews while researching host response to antibiotic treatments—which is distinct from the more traditional focus on the interaction between an antibody and the bacteria. Specifically, Volk is looking at treatment options for Staphylococcus aureus and Acinetobacter infections, which are among the leading pathogens in health care settings with antibiotic resistance. “I have always loved doing lab work and knew that I wanted to incorporate research into my pharmacy school education and my long-term career plans as a researcher and professor with a clinical practice,” says Volk. 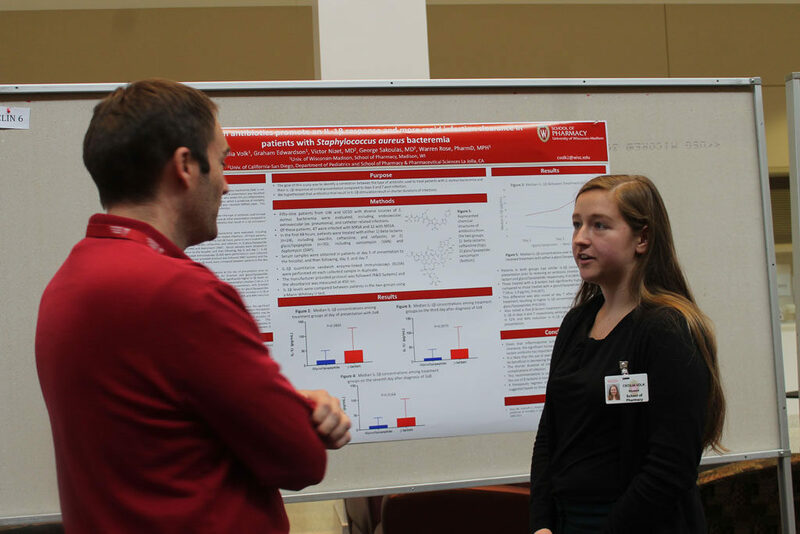 Cecilia Volk, second-year PharmD student, speaks with Associate Professor Warren Rose about her research at the PharmD and Pharm-Tox Research Symposium. PharmD students also conduct research in a clinical setting, working alongside faculty to test, monitor, and develop treatment options. Zachary Pedretti (DPH-3) worked with Associate Professor Susie Barnett of the Pharmacy Practice Division on an antimicrobial stewardship program at the William S. Middleton Memorial Veterans Hospital. Another student, Megan Wimmer (DPH-3), has found various ways to tie the School’s broad research opportunities together to nurture important skills. Wimmer first worked with Sandro Mecozzi, associate professor in the Pharmaceutical Sciences Division, on research investigating fluorine containing nanoemulsions as drug delivery systems, which she says research has helped her better understand the drug delivery and drug design processes. But like many students, Wimmer’s research interests also extend beyond the laboratory doors. Last fall, she left the Mecozzi Lab to start as a teaching assistant, working mainly with lecturer Amanda Margolis in the Pharmacy Practice Division. In that setting, her interests in both research and teaching combined into a research project focused on gamification in education. “I’m interested in education research because, as pharmacists, we’re going to be educating patients, providers, and future pharmacists as preceptors,” says Wimmer. Her research endeavors through the School of Pharmacy have been very different, but they both share a common focus that’s crucial to her future as a pharmacist. During orientation, PharmD students learn about research opportunities from faculty members who describe their work and their labs. Students can review information about the School of Pharmacy’s research groups online, and if they’re interested in working in a specific lab, they can apply to be hired by faculty. Students also can study with a specific professor by taking the School of Pharmacy’s independent study course, Pharm 699, and earn one to three credits per semester. Megan Wimmer, third-year PharmD student, presents her research on educational methods at the PharmD and Pharm-Tox Research Symposium. In addition, the Zeeh Pharmaceutical Experiment Station at the School of Pharmacy, which is dedicated to both UW–Madison research and private sector pharmaceutical and biopharmaceutical product development and drug delivery, also takes one to two PharmD students per semester or year, depending on the students’ availability, to work on industry-related projects. Another hands-on approach for students is presenting research poster sessions. Barry Gidal, professor and chair of the Pharmacy Practice Division, organizes Research Day each spring in the Health Sciences Learning Center (HSLC) atrium on the UW–Madison campus. PharmD students and undergraduate Pharmacology-Toxicology students present posters on their research work to a panel of faculty judges, pharmacy students, medical students, and physicians. The top three posters win travel awards to attend professional meetings. 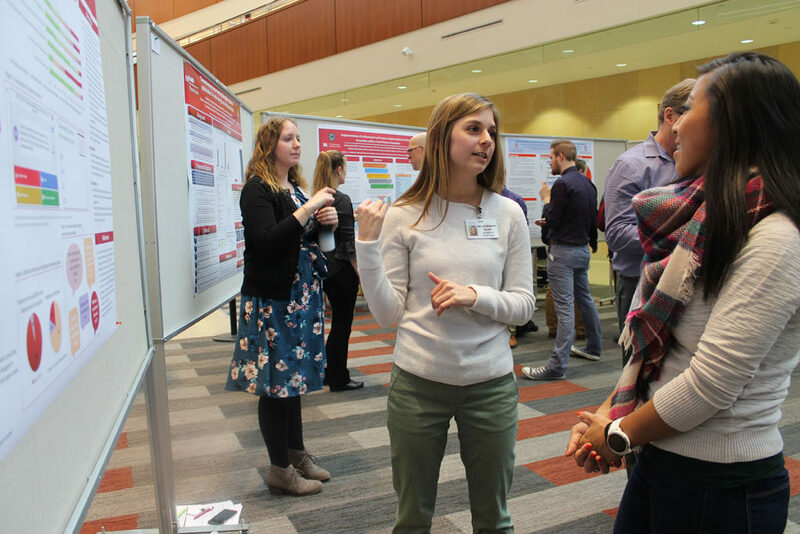 Another research presentation opportunity is the PharmD and Pharm-Tox Research Symposium, which includes research posters from PharmD and Pharm-Tox students, as well as pharmacy residents in the Madison area. Wimmer, Pedretti, and Volk presented their research at the 2018 symposium, organized by Lindsey Skubitz (DPH-3), gaining yet more experience in communicating complex ideas, honing presentation skills, and building presentation experience that employers and residency programs seek. PharmD students benefit from the research-rich environment at the School of Pharmacy, as well as from interdisciplinary research opportunities with other schools on campus, including the School of Nursing, School of Medicine and Public Health, and the La Follette School of Public Affairs. Research can make PharmD students more competitive for top jobs, especially for residency placement. 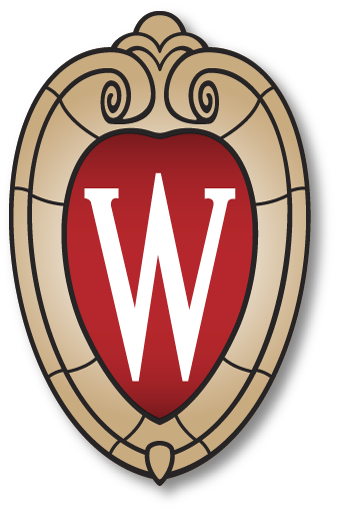 School of Pharmacy PharmD students were placed in a residency at a significantly higher rate than the national average—88 percent placement for the UW–Madison School of Pharmacy versus the national average of 65 percent in 2018. The deliberate efforts to infuse more research experiences in the PharmD program is part of the School’s strategic plan, which prioritizes opportunities for research within the PharmD curriculum. Moreover, the School has supported the university’s research culture with curricular changes two years ago that opened up more flexibility for elective credits, such as independent study. With the research comes a host of other experiences that are also valuable to student pharmacists, both in their education and their budding careers. Learn more about the PharmD program at the School of Pharmacy.